Edinburgh based boutique Spirits Company Wemyss Malts is delighted to announce the release of their latest single cask single malt whiskies. Each cask has been selected and named by the Wemyss tasting panel, under the watchful eye of industry aficionado Charlie Maclean. There are only a few hundred bottles from each cask and the recommended retail prices range from £55 to £90. 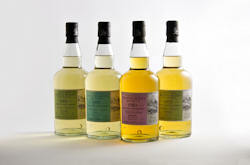 These bottlings will be available in selected retailers in the UK, EU and key Asian markets.